If you are a woman who's ever been pregnant before, you'll probably disagree with what I have to say next and possibly hate me for it, but: the worst thing about being pregnant is that none of my clothes fit me. To clarify, I've been unbelievably lucky so far in terms of side effects: no morning sickness for me. In fact, I've been hungry all the time since day one. Oh, and uncomfortably warm too. Thank god it's fall. Oh, right, the vest. I wanted the sporty look of a down-stuffed nylon vest, without the bulkiness (or the zippers that no longer close over my belly. grumble grumble.) So I went with simple cables on the front and the back, and ribbing on the sides; the cable twists are positioned to create some simple diagonal vees. Another advantage of this approach to cabling is that I never had to count rows to figure out when to twist; every RS row, I twisted in the column next to my previous twist. To make the vest a little more modern, I added a tall, double-thick collar which is a different color on the inside. 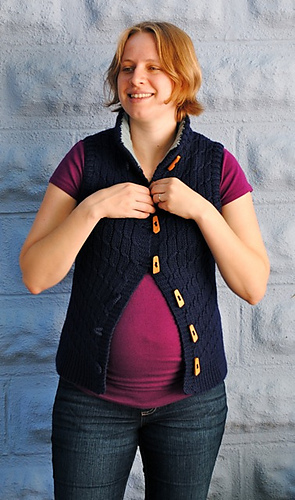 (DH thinks "handknit sweatervest" is practically the definition of old-person clothing. Then again, he wears socks with sandals.) The yarn is Quince&co Osprey in Peacoat and Bird's Egg. 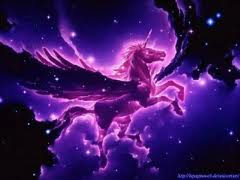 Aren't the colors fabulous? I think of navy blue as an incredibly boring color, but I just love how saturated Peacoat is. Osprey is a delicious aran-weight yarn which comes in fabulous colors and is both made locally (in Maine) and surprisingly affordable. 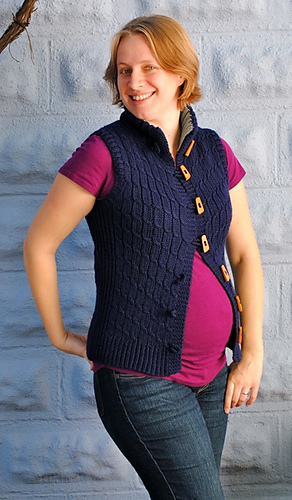 I loved working with it and it knit up super quickly on size ten needles. I'm a little worried about pilling at this gauge, but at this point, there's nothing to do but wait and see! 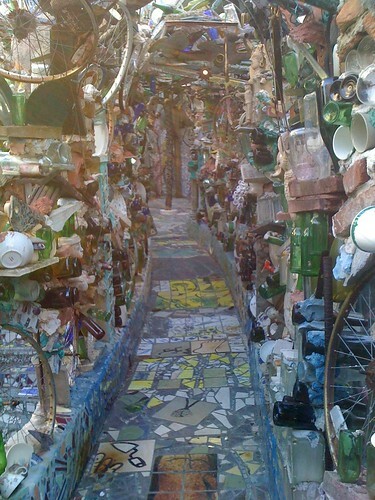 On Saturday my friend Katy and I were wandering around Philadelphia after a delicious visit to the Reading Terminal Market and a horrifying visit to the Mütter Museum, and we stumbled upon Philadelphia's Magic Gardens. 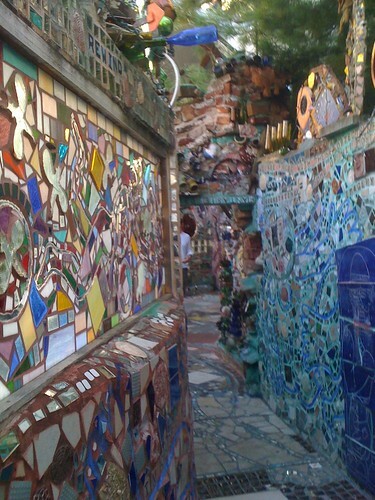 I was familiar with the artist responsible for this place, Isaiah Zagar, because I've seen the documentary about him, In a Dream. I have no idea when, where, or why I saw this documentary, which is perhaps a testament to both my shoddy memory of media I consume and the sheer volume of documentaries I've watched. It was a very fun place to walk around. It reminded me a little of the City Museum in St. Louis in its wacky artist's vision sort of vibe, although I have to say the City Museum wins out for its dangerous jungle gym appeal. 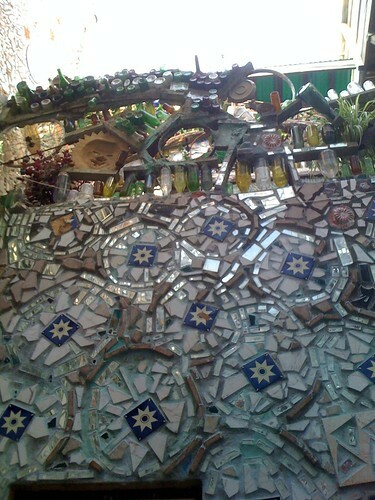 Magic Gardens is beautiful, though. Lots of passageways to explore. 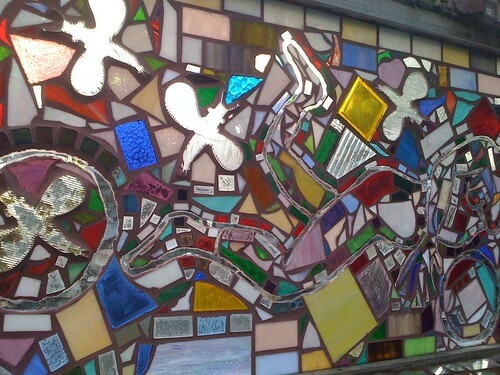 More visual stimuli than anyone can possibly know what to do with. Now, you might have spied in the last photo the thing that really caught my eye here. 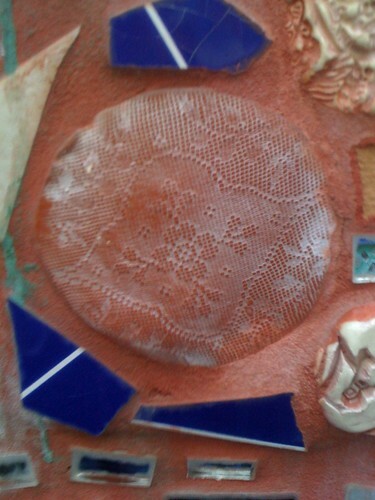 Zagar uses a technique where he presses crocheted and other lace items into the clay tiles he makes. They are so beautiful and I just started taking photos of them everywhere. 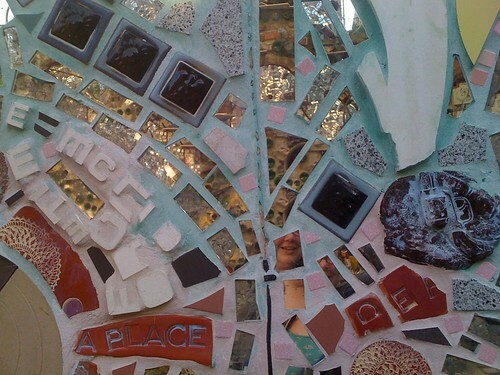 Given just how many of these tiles you can find in Magic Gardens, Zagar is clearly fascinated by the textures of lace fabrics. There's a positive and negative space thing going on in the tiles that seems to play on what's special about lace fabrics. 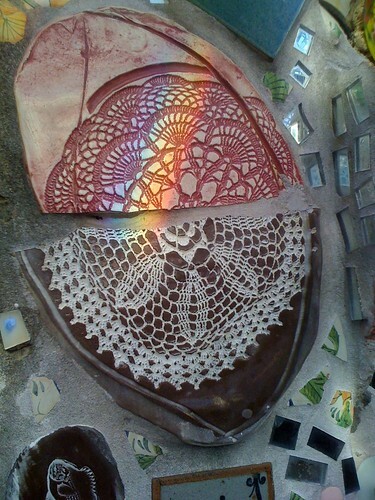 Lace fabric is doubly interesting for what it can do with light--diffuse it, dapple it, etc, which I guess makes it a little more magical to me than these tiles. 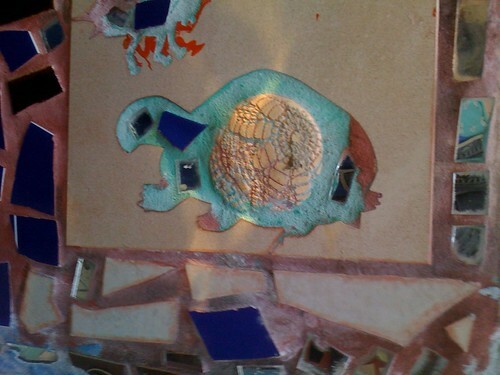 Still, I love these tiles and bought one in the gift shop! My other fun find this weekend was at the NY Aquarium in Coney Island, NY. I was there running a 5K charity race for turtle conservation (appropriate, given my running speed). 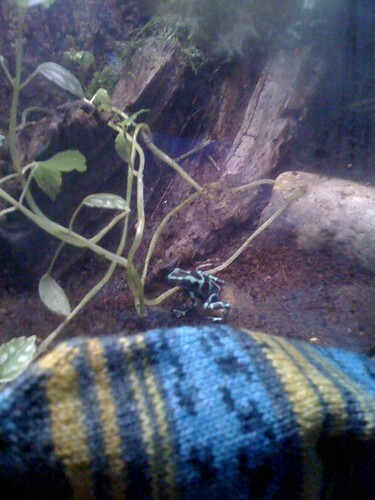 We toured the aquarium after the race and I met this adorable frog who wanted to pose with my on-the-go sock in progress. So cute. The next post you'll be seeing from me will no doubt be a Rhinebeck recap. Is this the year I finally buy a fleece? What other treasures will come home with me? How many sheep will I pet and how much maple cotton candy will I eat? Stay tuned.